March weddings in Texas are always a gamble from a weather standpoint. Will it be hot? Cold? Rainy? Sunny? For Emily and Mike, the forecast showed every possible type of weather in the week leading up to their wedding, but finally on the day of the event, it decided on a light rain. With an indoor contingency plan in place, the wedding coordinator approached Emily ten minutes before she was due to walk down the aisle to marry Mike, and asked her if she still wanted the ceremony outside. Emily’s answer was a resounding, “Yes!”. This decision can tell you a lot about the two of them. Whether rain or shine they have a good time, and we absolutely love that about them. 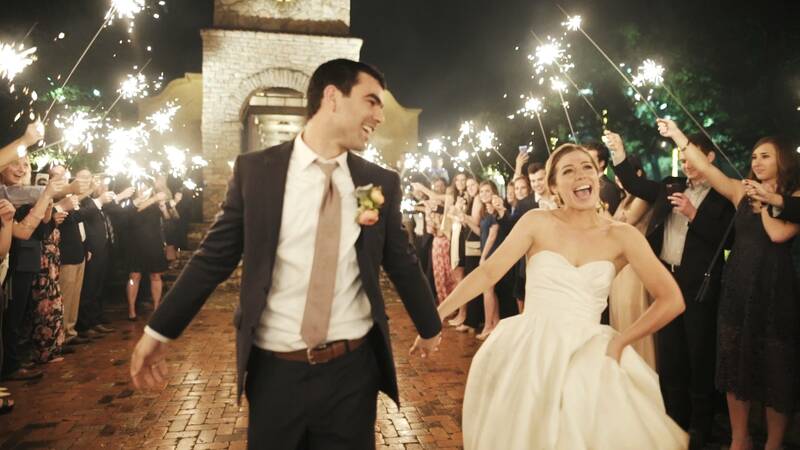 We would love to film your wedding rain or shine! Please get in touch. Emotional may be the best word to describe Caitlin and Tanner’s wedding day. In fact, we can’t really think of a time that one of them wasn’t happy crying. Misty-eyed tears started being shed while they struggled to read letters to us that they had written throughout their dating relationship. This soon accelerated into a weepy gift exchange, and culminated in heaving sobs as they saw each other for the first time. Surprisingly, they held it together pretty well for the ceremony, but when the toasts started they lost it all over again. The night ended with the two of them dancing in an empty reception hall, tears streaming down their faces. But we did say this wedding was emotional, and that word means far more than only happy tears. 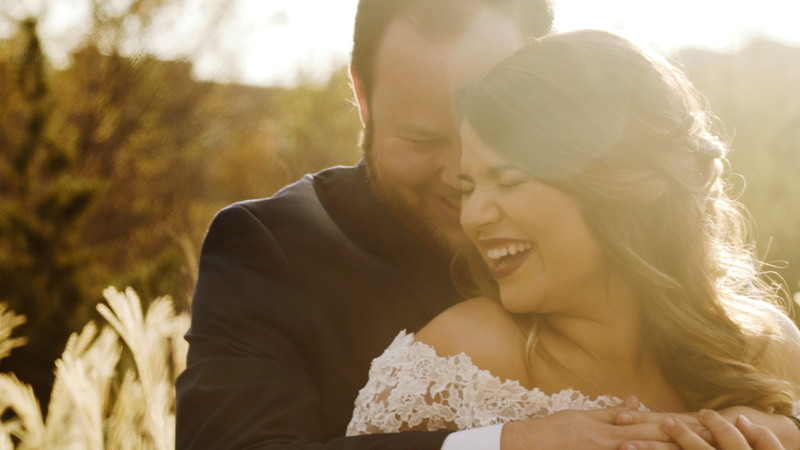 Laughter was present as Tanner vowed to Caitlin that he would “always have fun, be silly, and not take life too seriously.” A feeling of anticipation ran through the room as Tanner’s dad officiated the ceremony. And joy was seen in many creative ways by Caitlin and Tanner’s moves on the dance floor. We love emotional weddings and would love to film yours! Please get in touch. Many years, hundreds of letters, and thousands of prayers later, a young man named Henry walked into the gym where she worked. He was insightful, kind, and insisted on calling her “Victoria”, a name befitting a princess. More so than those earlier traits though, Henry was persistent. Now you may think at this point, “This is the guy! This is who she has been writing letters to! This is her (future) husband!”, and you wouldn’t be wrong about that. But nothing is ever that easy. Victoria and Henry began a friendship that soon culminated in a first date, where Henry asked her, “Do you see a future with us?”, to which Victoria immediately and directly replied, “No, I do not see a future with us.” But as I said earlier, Henry was persistent. That first date soon led to another, and Victoria’s letters and prayers began to be directed at Henry. This wedding film is the culmination of Victoria’s letters and Henry’s persistence. A wedding to a husband long dreamt for and a wife that was persistently pursued. But there is one other aspect to this story that needs to be told. Victoria and her dad have always been close, and he knew that while she was growing up she wrote letters to her future husband often. What he didn’t know is that she had also written something for him; a song that she wrote, recorded, and played when they danced together at her wedding reception. As Henry put it, “This was the best wedding ever”, and I would agree. Partially because it really was wonderful, and partially because Henry is Rachel’s cousin. We are thrilled to be related to such an incredible couple with an amazing story. Getting married? Rachel and I would love to film it! Please get in touch!